The wacky weather drove the butterflies away. 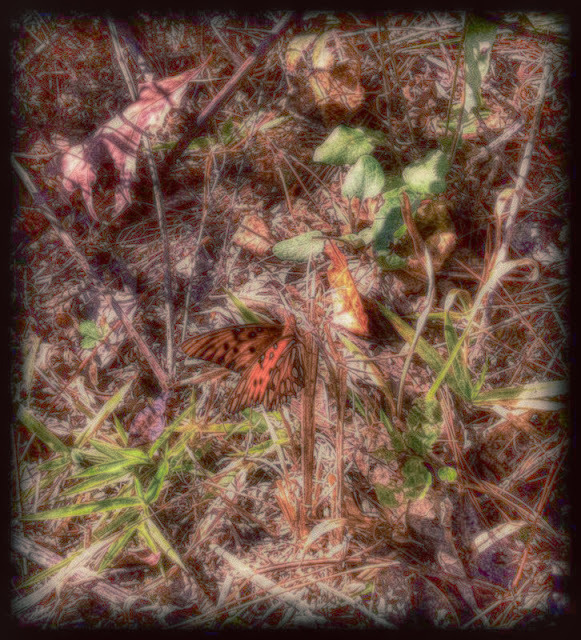 They were here to welcome March in with fluttering wings, and now that it's May, they are nowhere to be found. All the trees and shrubs around here are scratching the bows and saying, "What the heck is going on here?" Our peach tree generally wants to blossom in late February. But this year, it didn't start until the end of April. I figure it said, "Hey, Easter is late this year, and I'm not going to get excited until the bunny comes." On the other hand, the fig tree jumped out early and strong and then a frost bit all the new leaves. It put on a fresh set in April and fruit is just now coming onto the branches. I'm not here to debate climate change, but I will say this: In my 66 years on this planet, I've never seen weather this wacky. Pretty much seems normal up here in Jersey. When it comes to Climate change, my perspective over the last 60 years in this part of the country (very small sample) winters are clearly warmer, ponds and lakes seldom freeze over and never enough to skate on. Summers seem cooler, that might be because we never had air-conditioning, but I seem to remember many 100 degree days in summer, that is rare these days. I think we have the same weather. I agree, waky indeed. 70 degrees in February and 40 in May. We are heading to the coast this weekend. I was gonna pack lite but unfortunatly, I need to pack extra incase its cold! Wacky on this side of the world too. Some of our trees are donning their autumnal garb - and beside them a row of prunus is in blossom. Way toooo early. And I don't like to think of what will happen to the tender new growth when our first hard frost hits. Yes, we have had some flooding near where I live...Port Dalhousie. I went there on the weekend and the geese were swimming where one normally walks. Love the butterflies! What wacky weather? Our president says there's no such thing as global warming!! It's wacky weather here too and pretty much everywhere. I hoe it gets better soon. Our weather has been up and down too. So far April was warmer than what we've had in May. Leaving a little ice age is hard yo experience. Adaptation is the main answer. This Spring is a mirror image of last year. Warm Winter, wet and cool Spring. I just hope we can skip the snow in May! I'm trying to get the outside a bit up to standards but it's too cold and rainy to paint or plant. Hope it all works out South and North!